Experian Catalist estimates that higher VAT will add 2.5p and fuel duties will add a further 1p a litre to prices. 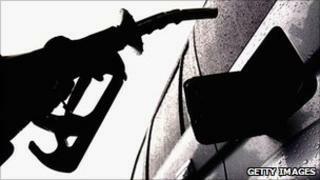 The diesel price of 125.73p a litre is 8p away from its record of July 2008. The records referred to do not take account of inflation. AA president Edmund King said the record high petrol prices were partly down to the freezing weather disrupting fuel deliveries. The price of oil - currently at about $90 a barrel - has been trading at its highest level for this year and is also putting pressure on fuel prices. The AA said the record fuel prices meant motorists would have to pay an average of almost £6 more to fill an average tank compared with the start of the year. Mr King told the BBC: "The gloomy thing on the horizon, quite frankly, is come January, we've got the VAT hike, plus another increase in fuel duty - and, those things combined will add about another 3.5p a litre. "So, for those people dependent on road transport, it's not looking like a very happy Christmas or indeed New Year." The RAC's motoring strategist, Adrian Tink, said: "It's unbelievable to think that, compared with this time last year, petrol is 13p a litre more expensive. "While the increases this year have been driven by a number of factors, you can't get away from the fact that we have seen five rises in fuel duty in the past two years - and we're due another one in January, plus a VAT rise." He called for January's fuel duty rise to be cancelled.